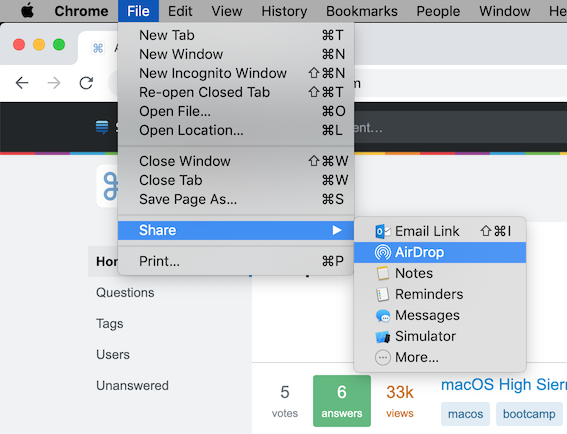 How do I share a chrome tab via AirDrop? I'd like to share my current Chrome page on macOS via AirDrop to an iOS device so that I can open it up in mobile Safari. If I use Safari on a desktop, this is easily done via: Share > AirDrop. Is there an equally easy way to do this on Chrome? How to Send Web Pages from Chrome to Your Phone and others recommend using a 3rd party tool called Pushbullet. This is cumbersome because it requires an extension to be installed on desktop Chrome, a 3rd party app installed on an iOS device, and will probably not open the page in mobile Safari (i.e. I'm guessing it'll open it up in mobile Chrome). Handoff can apparently solve this problem, but that requires you to be logged in to the same Apple account on both devices. Is there a way that this can work without being logged in to the same device, just as AirDrop via Safari works? Open the 'File' menu in Chrome, choose 'Share', then 'AirDrop'. Drag the current page from Chrome (via the bookmark/lock icon) on to the device in the AirDrop window. This will send a .webloc file that opens up in Mobile Safari just as intended. You could create a markdown file (.md extension) on macOS, paste in the URL, and AirDrop it to the device. Then on the device, accept the file and open with "Notes", which will contain a clickable URL. Alternatively, you could send a .webloc file by completing the below, but it opens a Safari preview within the "Files" application, rather than Safari itself (in iOS 12.2 at least). However, this process requires you to save the webloc file, which is a bit cumbersome to find/delete. Also, the Safari preview closes with upwards screen swipes. Not the answer you're looking for? Browse other questions tagged macos iphone google-chrome airdrop . Chrome can't load certain sites but Safari can - how can I diagnose the problem? reader mode on iOS Chrome?